Sporting Clube de Goa trashed Churchill Brothers 4-0 in a Group A clash in the Goa Police Cup played at Duler Stadium earlier today. Sporting played some dominant football in the first half as they went into the break with a 2-0 lead. The first opportunity of the second half came in the 54th minute when Victorino Fernandes was once again unlucky as his shots were blocked first by keeper Aliston and then by defender Janifer Clemente. At the hour mark referee Tejas Nagvenkar awarded a penalty when Victorino Fernandes was brought down by Clement in the box. Cajetan Fernandes made it 3-0 from the spot. Churchill had one glorious opportunity to reduce the margin but Pankaj Sona’s low shot went wide by a whisker with the Sporting defense beaten. In added time Avrhisto Fernandes was lucky as his long ranger slipped from the gloves of Churchill shot-stopper Aliston for the Flaming Orang’s fourth. However, the win is only a consolation for Sporting as Calangute Association had already qualified for the last four from the group. 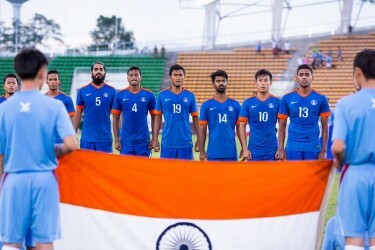 In the other match played at Ambelim Ground Salgaocar FC also notched up a 4-0 win over Indian Navy to set up a Semifinal clash against Calangute Association. Liston Colaco scored a brace while Ronaldo Oliveira and Macroy Peixote were the other two scorers for the Vasco based club.